In the early noughties Sony Ericsson had pioneered touchscreen smartphones, starting with the P800 announced in 2002, which was followed up by other high-end "P-Series" smartphones, the P900, P910 and P990. All of these featured a distinctive flip-down keypad that covered part of the display, and these devices ran Sony Ericsson's own flavour of Symbian running the UIQ interface. Although initial models had been well-received, the P990i (launched in 2005) ended up being a bit of a disaster. It was later, buggy and Sony Ericsson dropped support for it leaving owners in the lurch. So, the P1 was a bit of a reboot of the P-Series and it came at a time where they were renewed interest in smartphones. It wasn't an entirely new design. 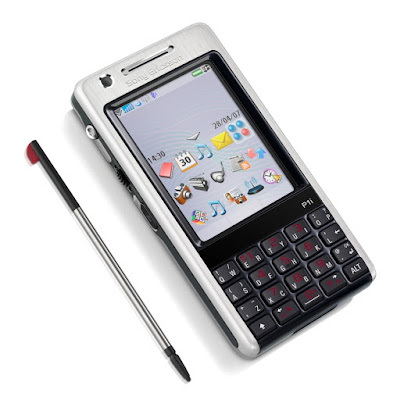 Based heavily on the lightweight M600 and its Walkman variant the W950, the P1 (called the P1i in most markets) ditched the keypad and instead had a more conventional QWERTY/numeric hybrid keypad instead. In order to fit this in, the screen shrank slightly to 2.6" but with the same resolution, and the whole thing was significantly less bulky than its predecessor. The removal of the flip pad simplified the software experience quite a lot. With the earlier P-Series phones, applications needed to adjust for the different screen sizes when the flip was open and closed. In some cases, the software behaved very differently. It's still a common problem today with landscape and portrait orientations, but it was a really annoying one with those P-Series devices. Other specifications were also improved and the P1 came with a capable 3.2 megapixel camera on the back, an FM radio, expandable memory, 3G support, WiFi and handwriting recognition. However, the world had moved on and the new Apple iPhone which was about to hit the market after being announced at the beginning of the year had a more polished user experience, a bigger screen and crucially that screen was a capacitive one which was easier to use. The P1 was not a huge success. P-Series users had been alienated over the P990i debacle, and the change in keypad on the P1 put off some customers even further. Without the loyalty of their user base and up against tough competition from other smartphones, the P1 struggled in the market. Successors to the P1 were planned but eventually cancelled, leaving the P1 as the very last P-Series phone. Sony Ericsson stuck with Symbian for a few more devices, notably the rather interesting Satio in 2009 and the awful Vivaz in 2010. Sony Ericsson's P-Series devices are quite collectible today, and although the P1 is uncommon it typically ranges in price between €30 to €120 depending on condition.